The Upton Farm Preservation Network made a presentation to the IRIS Group, which was tasked by the PEI provincial government to undertake an Island Heritage Study. The IRIS Group has travelled across the Island to provide groups and individuals the opportunity to share their views on the Island’s heritage and its future. The UFPN presentation, which can be read below, noted the rich history of the Upton Farmlands, including the Acadian settlement; the airport located there; the story of Louise Jenkins, who owned the property with her husband, and was the first female pilot on PEI; the race track located on the Farmlands; as well as the heritage value of the land itself. We are members of a working group representing the larger Upton Farm Preservation Network. The Network was created by a large number of people dedicated to seeing the Upton Farmlands remain as a greenspace. The Upton Farmlands is a 258-acre parcel of land that is divided by the Trans Canada Highway just east of the North River Causeway. It is the entrance to the City of Charlottetown. This land has a long history that is both interesting and significant. In the 1700’s when Samuel Holland and his crew surveyed the Island (previously Isle St. Jean), he found seven Acadian homesteads existing on the Upton Farmlands in the area known then as Riviere du Nord (North River). (see attached map). The census of 1752 listed the Acadian names and occupations of the folks making their homes there. As the Upton Farmlands has fresh water springs and natural wetlands that attract wildlife, it would have been a preferred place to settle even under the harsh circumstances the Acadians endured. 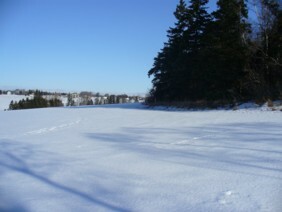 According to the City of Charlottetown’s website, the Upton Farmlands has been owned and operated by historically significant people. The Hon. Stephen Rice was a physician with the British at the Battle of Waterloo. His descendants, the Jenkins family, owned and operated this farm for several decades. Dr. J.T. Jenkins (1829-1919), built a horse trotting park there in the 1870’s. Dr. Jenkins held the reputation of being the most prominent breeder and importer of race horses in Eastern Canada at the time. His grandson, Colonel (Dr.) Jack S. Jenkins (1887-1972), was a cattle breeder and farmer and became established as a successful medical practitioner and surgical pioneer. His wife, Louise Jenkins, was the first woman to fly in PEI, and is listed as one of the first female pilots in Canada. She was the proud owner of her own plane, Puss Moth. Dr. Jenkins became an accomplished pilot on PEI in 1930 and played a major role in aviation by developing the first Island airport. Pilot Erroll Boyd and navigator Harry Connor were guests at Upton Farm on their way across the Atlantic. Boyd was the first Canadian to pilot a plane across the Atlantic ocean. The Jenkins’ architectural talent was also well-known and written about. Visiting guests would be ushered in through a driveway emerging from a little wood to find a picturesque home with gardens sloping down to the North River. Dr Jenkins eventually sold part of the property to the Federal Department of Agriculture in 1948. The site was operated as a research station for nearly 50 years. It operated as a dairy farm, and crops were still grown in 2007. In 2001, the land was transferred to Canada Lands Company. The Upton Farmlands is still a beautiful, pastoral piece of green property that slopes down to the North River and still attracts many birds and wildlife. It has become a very popular spot for walkers, birdwatchers, children playing, folks in wheelchairs, joggers, dog walkers, etc. It is a special place and a large part of our heritage. Our belief is that this wonderful farm should be preserved as part of the heritage of the City of Charlottetown and maintained as a sanctuary where people can go and view the wonderful vistas and views. There are few things and places in life that haven’t changed drastically over the years. We have the opportunity to save this unspoiled part of our history, let’s not squander it. This entry was posted on February 23, 2008 at 3:19 pm and is filed under History, Raising Awareness. You can follow any responses to this entry through the RSS 2.0 feed. You can leave a response, or trackback from your own site.